Preview: Do you tend to overspend when you go to the store? 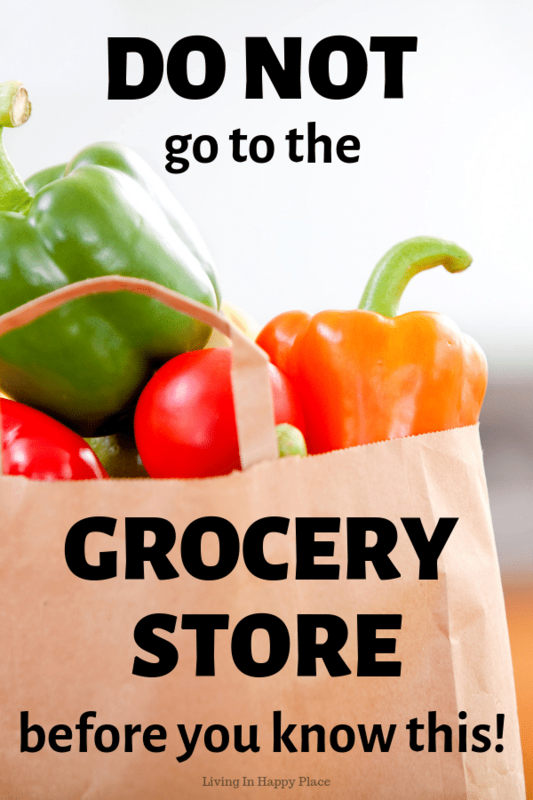 These tips will save money shopping every time you go to the store! Shop smart to save money! Every trip to the store should not end in buyers remorse! If you are shopping for a family on a budget, you know how tricky it can be to shop and get ONLY what you need and stick to your family grocery budget. 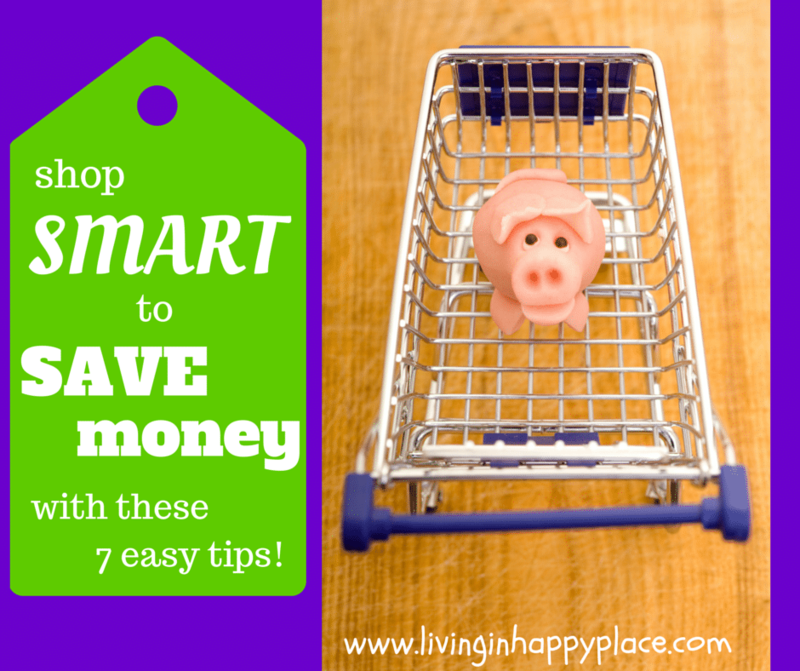 Use these 7 smart tips to curb overspending and stay on budget at the store! Do you go to Target for milk and spend $100? Do you come home from the shopping with buyer’s remorse? Do you cringe every time your credit card bill shows up in your email? We have all been there. You go to the store for milk and diapers and when you leave the store, your cart is full and your wallet is empty. We are never sure how it happens, but we always seem to end up with more than we need and a huge bill to prove it. I am super guilty of this- just ask my husband. I have “shiny object syndrome” in the stores. I don’t need it, I don’t know what I will do with it, I have no room for it in my house… but I buy it anyway. I love shopping but sometimes my wallet does not share this passion. I have been able to curb my enthusiasm for shopping over the years by coming up with a few tricks that allow me to still get what I need without overspending. 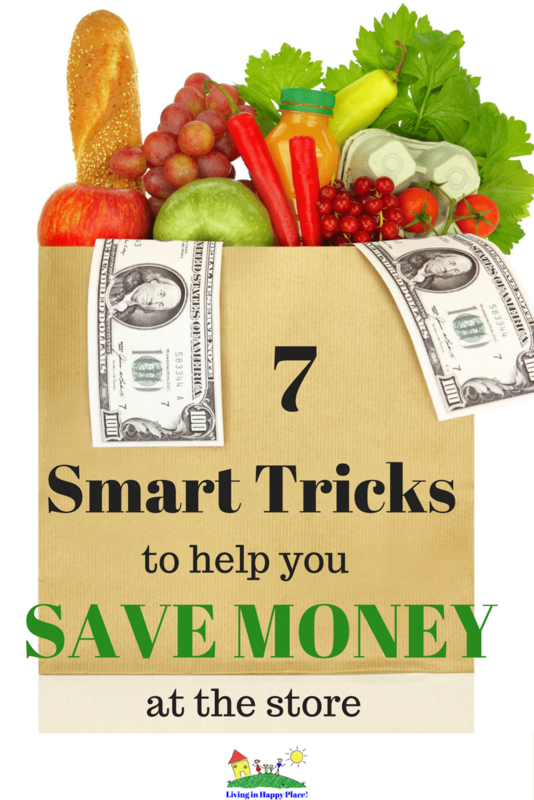 I want to share these 7 pain-free ways to make small cuts that add can add up to big savings in your budget! 1. Only carry cash– Remember the days when you used to have to “cash” your paycheck. I remember standing in a long line at the bank on Fridays. It was a very visual way to gauge how much money you had to spend. Now that we only see numbers on a screen that “represent” how much money we have, it is so much easier to overspend. Try going back to the old-days of cash only. By carrying enough cash on you to get just what you need you will be less likely to make frivolous purchases. 2. Put one thing back– Before you step into the checkout line, stop, check your cart, and put at least one item back. Chances are, you have something in your cart you don’t need. Taking a minute to think through purchases will reduce impulse buys and save some money. When you get home and start putting things away into already stuffed cupboards and closets- you will be really glad you didn’t make that frivolous purchase. Along those same lines– keeping a shopping list and sticking to it can be an easy way to stay on track. You can get a free printable shopping list, arranged by department, here to keep you from wandering the aisles and finding things that are not on your list! 3. Grocery shop at a grocery store– Supercenters may be convenient, but they also make it “convenient” for you to buy things you don’t really need. If prices are comparable, shop at a grocery store for groceries. This can eliminate the impulse to buy things other than the food items on your list (such as home décor, health and beauty products, or toys – especially if you are shopping with children!). Try a discount grocery store for extra savings. Many of them now carry brand name products as well as their store brand- all at a discount. 4. Use Coupons– Coupons have become so easy to access and use that there is no reason not to utilize them! Combining store sales with coupons can easily add up to big savings. You do not have to be an “extreme couponer” to experience saving. Just take your store flyer, then search for your favorite items to find coupons. The savings really add up when you use them each trip. You can also get cash back for things you are already buying using the ibotta app! With 289 eligible stores and almost 500 million dollars paid in cash back rewards, ibotta is a great way to earn cash back every time you shop! 5. Stay out of the store– If we only need milk, bread, and diapers , I have to send my husband to get them. I know I will come back with ten items that were not on my list and I could have done without. I send him instead because I know he will stick to the list. If possible, try sending someone else to the store when you only need a few specific things. Select someone who doesn’t share your spending habits and is disciplined about sticking to the list of items needed. 6. Remember that shopping is not a hobby– If you are on a budget, shopping is not a good hobby to keep. This is can be really hard for a stay-at-home moms like me. Sometimes we just need out of the house! There are better ways to keep busy. Try taking up a hobby that does not cost money such as walking (but not in the mall!) or hiking. If you feel cabin-fever creeping in, take the kids to your local library or find another Mom to meet up for play dates at the park. 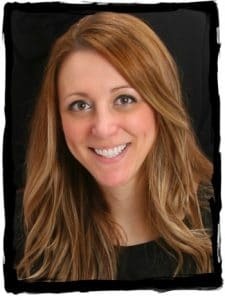 There are so many Mommy Facebook groups; try searching for one in your area. 7. Be creative about needs versus wants– Even if you are on a budget, no one wants to feel over-restricted. We work hard and we should be able to buy something when we want it, right? Making small cuts in one place can allow for a little extra money to splurge on occasion. Be creative. Try some new recipes to use the items in your kitchen before buying more groceries. Can you make a less expensive and safer version of some cleaning products? (Follow me on Pinterest for lots of DIY cleaning products!). Saving money is all about balance. Making small changes can really add up to big savings! Painless, right? You can get what you need and stay on budget with a few simple changes in the way you shop. You can be a Happy Mom by using these tricks to expand your budget and save money shopping!